After my stay in the cold and wet of Ruby Valley, Cathedral Gorge State Campground near Caliente, Nevada was a wonderful place to relax in the sun and soak up some warmth. While relaxing with a book, a beer and some pine nuts, I contemplated my next destination. If the weather in the mountains had been better, I would have considered heading back up US 93 toward Idaho to various locations that I had map-scouted. But, this was not the case, so I decided to stay with warmth and go to Death Valley National Park even though I knew that there was a chance that I would be going from warm to hot. Skillet hot, maybe. In order to get to Death Valley from Cathedral Gorge, it was necessary to take a half-circle, roundabout route that would take the better part of a day of driving through the desert. My start location was essentially Caliente on US 93 and my destination was Beatty on US 95 where I would stay overnight before entering Death Valley. 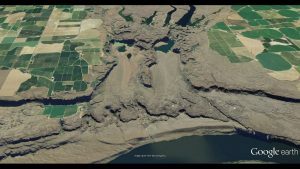 As can be seen from the Google Map there was no direct way to get from Caliente to Beatty which is just outside the eastern entrance of the Park. At Crystal Springs, I connected to SR 375 then to US 6 west and finally to US 95 south. SR 375 is known as the Extraterrestrial Highway, I had previously written an article for Oliver about this Highway and my stop for lunch at Rachel. When you look at the above map, you will see that there is a large area generally west of US 93 and SR 375 and east of US 95 where roads are not indicated. 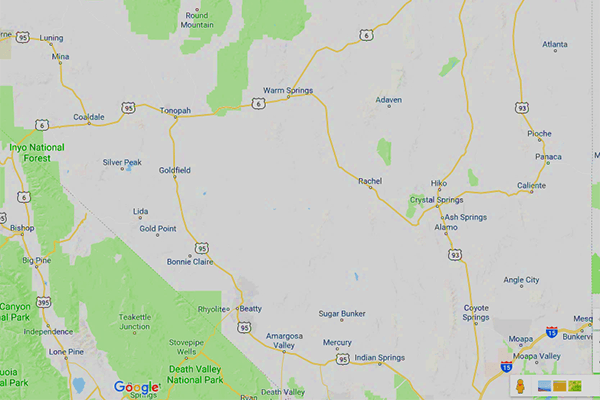 Not knowing any more, most people looking at this map that did not depict roads through this area, would maybe not notice or maybe think that this not untypical of Nevada as there are many large areas in Nevada that can’t be reached by paved roads. This is true but this is not the case for this area. My Benchmark Map Book shows a few minor dirt roads around the perimeter of this area and also indicates that this area has the Nellis Air Force Range. I don’t know why Google Maps didn’t show the same. The below map (not Benchmark) gives much more detail. 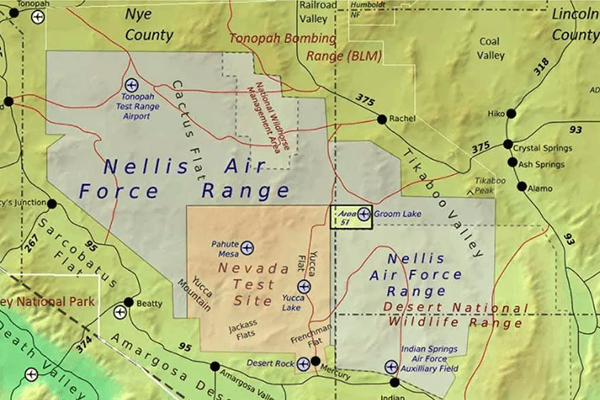 Along with the NAFR, this is the location of Area 51. 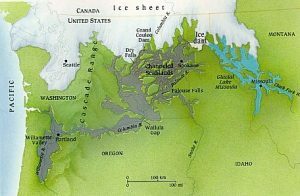 This map better illustrates what is in this territory. So now it can be understood why I had to do a roundabout drive. From this map it can be better understood why Rachel is often the staging location for folks wanting to see exotic military aircraft or UFOs. Alas, I didn’t chance to see either. I stayed overnight at a RV park in Beatty. When I left Beatty at 8:00 the next morning, it was 58 degrees. 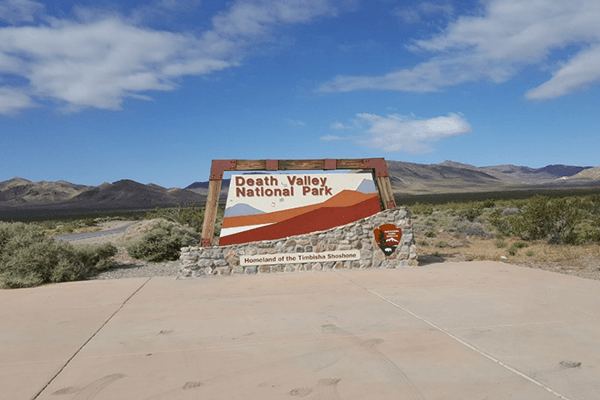 The eastern entrance of Death Valley National Park is 8 miles from Beatty. By the time I reached the entrance sign, it was 70 degrees. By noon it was 84 degrees with a very dry wind, capable of sucking the beer right out of you. The day topped out at 89 degrees. Death Valley is the largest national park in the National Park System of the lower 48 states, a small part of it is in Nevada but the by far the greatest amount is in California. It has immense amounts of desert, extensive views, winding canyons and intriguing features of terrain and landscape. If you like geology, this is the place to go. 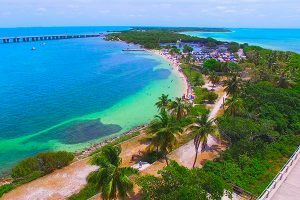 The best time to explore this Park is during the winter months. I was there in the early part of June, which is the beginning of the hot season. One time in July, I crossed through the Park going to the Grand Canyon. When I stopped for a pit stop at Stovepipe Wells, the temperature was 121 degrees, as hot as the namesake stovepipe. My primary reason to go to Death Valley was to visit Scotty’s Castle. The below picture was reproduced from the Death Valley National Park website. As can be seen from the image, it is not a castle. It is a Mission Revival and Spanish Colonial Revival Villa. There is an interesting story as to why it is called “Scotty’s Castle”, worth researching if you like good stories. This style of architecture and construction has always intrigued me so I was very eager to spend an extended length of time there. Unfortunately, this was not to be the case. When I got to Death Valley and the turnoff toward Scotty’s Castle, I was confronted with a “Road Closed” sign. Further information was that the Scotty’s Castle area had been closed due to flood damage and would not reopen until 2020. This is the reason that I used the above photo - I couldn’t take any of my own. It is hard to imagine that a flood could occur in Death Valley. 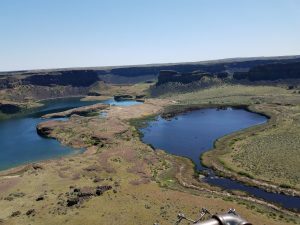 It is the hottest, driest place in the U.S. - it has the lowest annual rainfall in the Country. The Valley’s average annual rainfall is less than 2.5 inches. So, how could so little rainfall cause a flood? Answer: Any “average” includes typical circumstances and outlier or exceptional circumstances. These may be far outside what the average would indicate. It was an outlier event that caused the damage to Scotty’s Castle. A desert storm can drop tens of inches of rain in just a few minutes. The desert is notorious for having flash floods especially in the Desert Monsoon season. Washes or gullies that are normally dry but drain huge areas can become swollen, raging rivers in a matter of minutes. 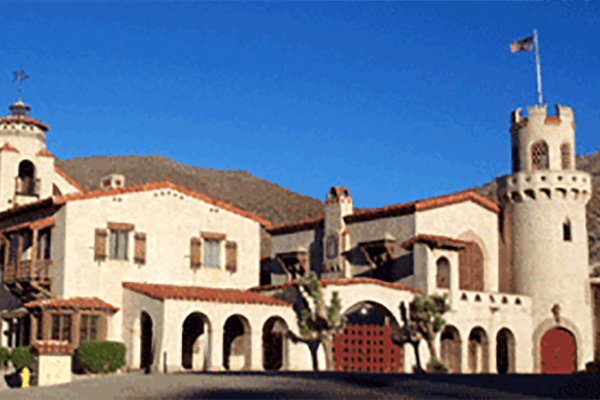 Scotty’s Castle is located in the northern part of Death Valley in a canyon in the Grapevine Mountains. 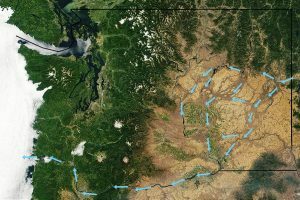 The worst of flash floods typically occur over mountains, so there is the answer. Flooding in Grapevine Canyon from a severe thunderstorm damaged infrastructure and out-buildings in the building complex and destroyed the road to Scotty's Castle. It also eliminated any chance of studying the architecture of the “Castle” until 2020, a year that sounds rather futuristic and science fictionally but is only two years away. After I crossed the road to Scotty’s Castle and the indicated closed sign, I was forced to re-evaluate my travel plans. Rather than return back to Beatty and US 95, I decided to go to the RV Park at Stovepipe Wells for a few days and tour about the Valley. If you look closely, you will see my Oliver behind the General Store at Stovepipe Wells. Or maybe not. It is actually just barely out of the picture to the right. The RV Park was just a gravelled area with utilities and without shade. 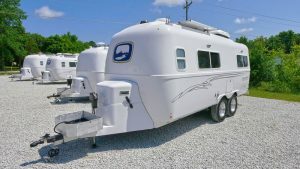 When I purchased my Oliver, I purchased a second awning for the street side of the trailer. I did this because I knew that, on occasion, I would camp in the summer where there was limited shade and also would be in the desert from time to time. Most times that I camp, I am not connected to utilities, so AC is not possible, therefore the extra awning shade can be very valuable. During these times, keeping the sun off the sides and windows of the Oliver can reduce the heat load that would otherwise accumulate inside. As well, for those times this extra shade would be most welcome for being outside as one could sit in shade on either side of the Oliver, according to the sun’s position in the sky. Stovepipe Wells was such a camping place that I needed to use both of my awnings to shade the Oliver. It helped significantly to reduce heat load but I still had to run my AC by evening time. Other nearby RVs ran their AC constantly, without let-up. It is amazingly dry in the Valley; one can watch liquid spilled on the ground disappear within a few seconds. The wind seemed to blow oven hot. With the dry wind it seemed hotter than the high-eighties that was indicated on the temperature gauge. It was even hotter at Furnace Creek. 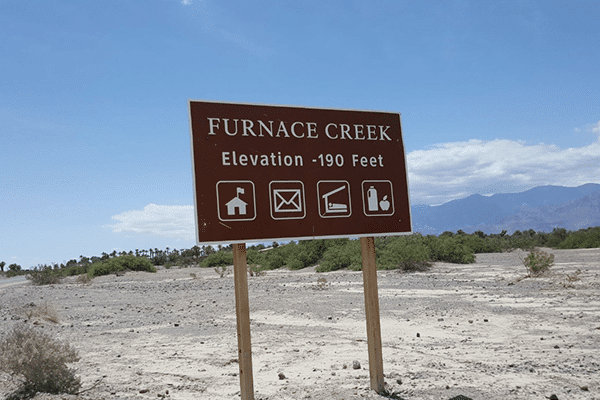 The highest official recorded air temperature in the world, 134 degrees, occurred at Furnace Creek in 1913. 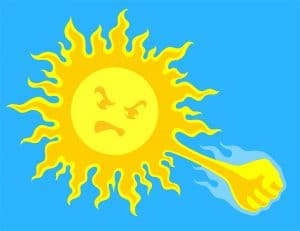 For the five days prior to this recordation, 129 degrees was recorded. Furnace Creek is an oasis, one of the few places on the Valley floor where one can observe plants, mostly Mesquite and Tamarisk. Mesquite is a native species. Tamarisk or salt cedar is an invasive import from Eurasia that unfortunately is creating a great deal of problems for the West. One hundred and ninety feet below sea level and I still couldn’t find any shell-fish. While Furnace Creek has the distinction of being the hottest place in the Valley, it is not the lowest point. The lowest point in the Valley is Badwater Basin at -282 feet below sea level. I had thought that I would spend a day, maybe two, checking out Scotty’s Castle but being unable to accomplish that, I had to re-evaluate my stay. The high for my first day was 89 degrees, it was hotter the second day with triple digits predicted for the following day, plus high winds. Not my cup of beer, so I decided to look for other opportunities to be someplace else. Early the next morning, I left Stovepipe Wells heading west toward US 395. 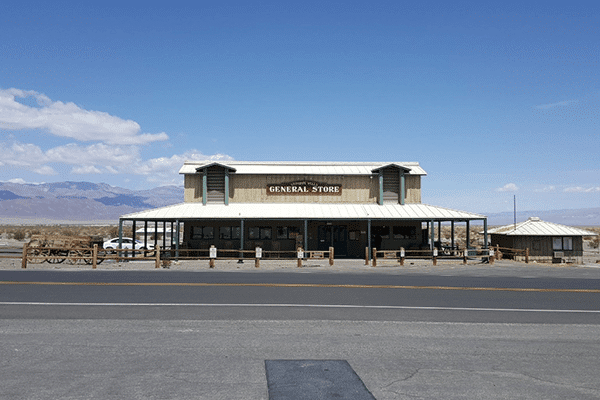 Once on 395, I thought that I would breakfast at Lone Pine but I dawdled so much in the Panamint Mountains, at Panamint Springs and along Owens Lake that by the time I got to Lone Pine, it was nearly lunch time. That being so, I decided to go fifty miles further north to Bishop and get a sandwich at the locally famous Schat’s Bakery. Bishop is a high attractor location as a temporary stop for travelers along 395 as well as an area destination for campers, for hikers and in the winter, skiers. Almost everyone who has driven 395 more than once, because of word of mouth, has stopped at this bakery for sandwiches and Sheep herder Bread. I have driven 395 and passed through Bishop a number of times before and always stopped for a brief respite, usually at Schat’s. Almost always, the curbs were lined with cars and RVs and crowds of travelers and tourists were on the sidewalks going about the business of entering shops and restaurants. As I drove through the downtown area, I noticed fewer people on the sidewalks and was amazed find that there were no vehicles at curbside. It took me a minute or so to realize that the curbs had been painted red and parking was not allowed. There were a couple of signs that I saw indicating off street parking but not being able to see the parking area before entering, I did not attempt to enter as I have found from past experience such places can be a trap for a truck and trailer because of tight turns and problematic ability to reverse. I am fairly paranoid about being trapped into such places. One such experience was all it took to create that paranoia. That time, thanks to a Good Samaritan, who helped guide me around two tight turns and prevented other cars from crowding me so as to allow me to back up, I was able to extricate from my predicament. The effect of that experience was the indicated paranoia. Being unable to stop curbside and not sure about other parking, I regretfully drove on, concluding that I would have to find a fast food place on the edge of town for lunch instead of a sandwich from Schat’s. As I drove on, I wondered about the mindset that thought that preventing travelers and tourists from stopping curbside to patronize businesses was a good thing. It seemed counter intuitive to me. I thought it would likely kill the golden goose as, at least to me. Further along, about three-quarters of a mile past Schat’s, I passed a large empty parking lot for an out-of-business market. Ignoring the No Trespassing sign, I pulled into the empty lot and parked. On impulse, triggered by the open parking lot, I decided that I would walk back to Schat’s and the sandwich that I craved. But, I was resentful about having to walk that far. The walk was not strenuous but I made it so with my attitude. I mentally groused that making an old fat man walk “nearly a mile” for a sandwich was just mean – real mean. Later, I laughed at myself but at the time …. When I returned, three other RVs had also parked there. One scofflaw can create a crowd of scofflaws, it seems. Lead by example - right? 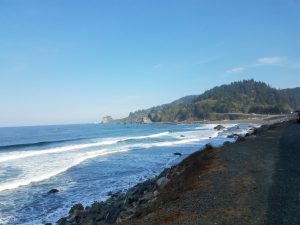 On the return walk, I realized that my irritable attitude was because I was tired of traveling and was missing being home. I therefore decided that I would travel north on 395 to Lee Vining and take SR 120 and then SR 270 to the Bodie Ghost Town, where I would overnight. And then in the morning continue on SR 120 to the east entrance of Yosemite, drive over the Sierras to the Central Valley and then home. Nice plan but it was a no go, SR 120 was closed because of snow. This was the first week in June, usually SR 120 was open before this time. This left me with only one recourse, if I wanted to go home, which was to go to Reno and take IS 80 over the Sierras. Upon arrival at Reno, I immediately started up the grade on IS 80 toward Donner Pass, thinking that I would stop at the Cabela’s Store in Boomtown, wander around the store some and then find a restaurant for dinner and stay overnight in Cabela’s parking lot. 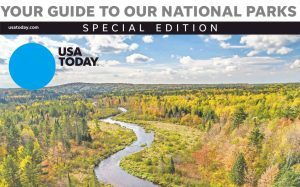 I first stopped at a gas station at the Cabela’s exit to fill up before going to the Store. While doing this, I realized that really did not want to spend the night in a parking lot with intrusive overhead lights near a loud, busy freeway. With that understanding, I returned to IS 80 and drove over Donner Pass to SR 20 west until I got to the Skillman Horse Camp in the Tahoe National Forest, where I stayed the night. At that point, I was six hours from home. By first light, I eagerly left for home without making breakfast. Nevada City provided an opportunity to purchase a breakfast sandwich and explain the virtues of the Oliver to an inquisitive stranger. (This happens a lot.) By 2:30 I was receiving hugs from my wife, daughter and my two grandchildren and learning that the welcome home dinner my wife was preparing was fried chicken. Safely home, with my family, and fried chicken - how great is that?